I make Tava a couple of nights ago. This is adated from Tessa Kiros book, Falling Cloudberries. Despite making lotsa substitutions such as using grape tomatoes, less potatoes and using cumin powder, the tava still came out good. This is so simple. It's a very typical Cypriot all-in-one-meal. You just need the time to prepare the lamb and vegetables, then you can fling it in the oven, go out for a (Greek) coffee and come home to a ready meal. You could use lamb chops and leave them whole instead of cutting them into chunks, which makes it even simpler. And it doesn't need much by way of accompaniments, perhaps a salad or some simply sauteed vegetables. 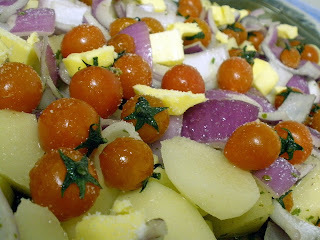 Preheat your oven to 180°C,Put the onion, potato and lamb in a 20 cup-capacity casserole dish or a deep baking dish. Season with salt and pepper. Add the parsley, cumin and olive oil and mix thoroughly very well with your hands. Put the tomato slices on top in a single layer and season lightly with salt. Dot the butter over the top and pour about 1/2 cup of water around the sides of the dis. Cover with foil and bake for 2 hours, tilting the dish from side to side a couple of times and spooning some of the pan juices over the top. The lamb should be very tender, and the potatoes soft. Remove the foil, increase the oven temperature to 200°C and cook for another 45 mins or so, turning the lamb halfway through, or until the meat and potatoes are a little browned and the liquid has reduced. Serve hot or at room temperature.